E-eh chitaurai tinzwe imi maindiitisa nharo. I want to hear from those who were criticizing me when I told you that this country is run by the junta. Mapombi is always a gentleman handivanzi kana vachida ngavauye vandipfure nepfuti just like what they did in Harare; ndinofirakureva ini. Nyika ino iri kutongwa neJunta and it's very simple to see that – havanyanyoshandisa njere they use too much emotions. Why shooting and killing people? Why, why? Simply because of elections? We are all Zimbabweans so why killing each other like this? Simply because you have arms then you can just fire live bullets on defenseless people. Zvimwe nyaraiwo varume. Mapombi writes to you with a heavy heart following the death of innocent people 0n the streets of Harare in post-election violence. The development that happened in Harare where soldiers are alleged to have shot and killed people demonstrating confirms what I have been always been saying that this country is being run by the junta. Nyika yava kutongwa nejunta vakomana nevasikana, vana baba nana amai iyi. The challenge with the junta is that they hardly think vanhu ivava, they act according to the instruction and Mapombi would like to think that vanga vatumwa kuti endai mungondouraya one chete muchaona vanhu vachitiza. Unfortunately, people were not intimidated by one incident which probably resulted in more shooting and killing. But Mapombi wants to ask; is this really necessary my fellow Zimbabweans? Zvinotibatsireiko kuurayana kana kurovana? Does this make our Zimbabwe better? We are all Zimbabweans but with political differences chete chete so why do we engage in violence? The late VP John Nkomo used to tell us that peace begins with me, peace begins with you, peace begins with us. Let us exercise peace and tolerance, please. I know the opposition supporters would want to justify themselves and say they were right to demonstrate. Yes, it is a constitutional right to demonstrate peacefully but Mapombi does not think there was need for the demonstration especially two days after elections. Ko dai takamirira ZEC yaita basa rayo zvaidii because the five days that are stipulated in the electoral act for ZEC to announce the elections have not lapsed. This was avoidable my fellow Zimbabweans. Of course ZEC is hard to trust – chero neniwo Mapombi anonzi nevanhu ndinopenga, I also don't trust ZEC. By the way I heard Kedha akaenda kuZec nezuro rakacheka nyika? Kkkkkkk hanzi ndodeiko ikoko baba vangu wee kkkkk apa hasha dzikati dziri tii, hopefully Chigumba haana kusiya adzingwa basa kana kurohwa ikoko because erekisheni yacho yakaoma Chamisa waita chisionekwi humhandara hwaamai, mashura mudunhu. Mapombi was thinking that kana zvanetsa umwe neumwe haangotonga vanhu vakamuvhotera kuti zvisanetsa. ED oenda kuUzumba, Chiredzi neMwenezi then Chamisa wotonga hake Harare and Bulawayo, zvingadii tikadaro? Kkkkkk imagine ED addressing vakomana vemombe, house maids, zvikule nechembere dzekumusha while Chamisa addresses the technocrats – engineers, lawyers, accountants, doctors and the business community. Something should be done to our laws because we cannot allow a situation where people in Mwenezi decide the way forward for this country against the technocrats. But I like what Morgan Tsvangirai once said; you can rig the elections but not the economy. Fellow Zimbabweans let us allow Zanu PF to rule if they feel they won this election freely and fairly. Regai vatitonge and see if they will improve the economy. Now that some international observers have declared that these elections were not free and fair, let us wait and see how it will go in as far as the economy is concerned. Maybe Britain will help Zanu PF out of the mess since they are said to be allies now. Let us wait and see if they can rig the economy as well. At least the elections were peaceful and I want to thank ED for that. However, this post-election period is now violent and I am blaming MDC Alliance for that. Why not wait? Zec still has up to Saturday to do meticulous verification. O-oh yes meticulous verification kkkkkkkkkkkk hahahaha Zec haina kana ganda kumeso zvayo. 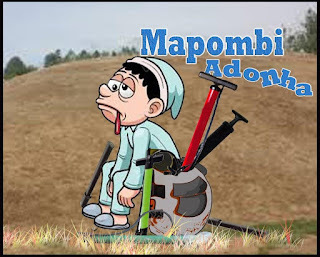 Mapombi is in cloud nine – ndiri mudenga rechinomwe chairo. The Special Advisor to the President mukoma Chris was taught a good lesson paNorton apa. Manje ukaona munhu achitadza a small constituency like Norton wozoti nyika yose zvayo, it's a clear indication that the special advisor is not special in any way. Our President is being fed with wrong advice and I am sure this is the reason he is struggling to beat Chamisa when he as two-thirds majority in parliament. Hazvaimbofanira kunetsa kuhwina izvi kana Zanu yakawana over 150 MPs, ED could have simply won this election with over 75 percent but zvinenge zviri kutonetsa. Mapombi is happy that whatever decision Zanu PF is going to make, they now know that vanhu havachada. People who matter in the day to day running of the country havachada. Of course people in the rural areas who are struggling to bring food on the table are the ones who vote for him after receiving food aid and farming inputs. Had it not been vote buying and intimidation Zanu PF could have lost by a humiliating margin. Anyway, it's almost lunch time guys let me go ndindokanga zvangu maputi angu for lunch ndizvidyire. But before I go Maopombi would like to encourage people to exercise tolerance; let us not fight. Politics come and go but we will remain; at the end we all Zimbabwe.